(APN) ATLANTA — Ann Melissa Firestone, 79, a senior advocate who was well-known in Atlanta’s civil engagement community, passed away on April 10, 2017. In Firestone’s honor, the City Council of Atlanta adopted an ordinance, 17-O-1246, on May 24, 2017, to create a crosswalk outside of the Cosby Spear highrise. On October 30, 2017, the Melissa Firestone Crosswalk was dedicated in her honor. The crosswalk is located on Linden Avenue NE, between Central Park Place NE and Hunt Street NE. Firestone was a resident advocate at her senior highrise, Cosby Spear, in Midtown. She previously was the President of the Cosby Spear resident association, and served three terms, according to Diane Wright, former President of the Jurisdiction-wide Resident Advisory Board. “She was a good president during her term, and she fought for the people,” Wright told Atlanta Progressive News. “She would go to all the meetings. She kept up with what was going on, City Council and all of it, even after she was president,” Wright said. “She showed up and she showed out. Natalie and I are thankful to have her in our lives. Our District would not be what it is without Melissa Firestone,” Councilman Kwanza Hall (District 2) told Atlanta Progressive News. “As a young couple coming into the neighborhood in 1991, at an NPU M meeting, Natalie and I began getting our exposure for how communities lobby and leverage and garner what they deserve from the government and from the business community,” Hall said. “Ms. Firestone was a strong advocate and committed neighborhood activist,” Hall said. “If you gave her a ride, that was her time to talk about whatever she wanted to talk about and move a collective agenda forward with people who had the power to make that happen,” Hall said. Firestone served as a board member of Fourth Ward West and its predecessor organization, Central Atlanta Neighbors. She served on Neighborhood Planning Unit M, and was its representative to the Atlanta Planning Advisory Board. Firestone served for several years as Chair of the APAB Transportation Committee. 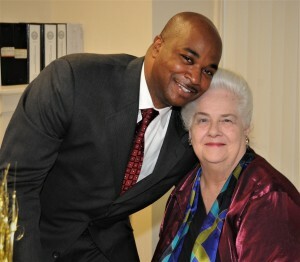 She also served as an advocate for many issues involving senior mobility and causes in her community. For twenty years, she was a board member of the Fulton County Government Commission on Disability Affairs. Recently, she was responsible for the addition of a crosswalk, curb cut, and ramp at the Linden Avenue entrance of the Cosby Spear Highrise to Central Park, making it possible for residents of Cosby Spear and others to access the park without navigating curbs and steps. Firestone also was a member of Atlanta’s arts community. Ms. Firestone was buried at Lakewood Cemetery in Palmetto, Georgia. “How could you not be a fan of Melissa? She was a tireless advocate for senior citizens,” Matt Garbett, former President of Fourth Ward West, told Atlanta Progressive News. “My fondest memories of her… (include) that leopard print shawl that she wore,” Garbett said, noting that Firestone’s trademark was to wear bright, colorful, and elegant clothing. “Coming into a room, you knew what type of outfit Melissa would be wearing,” he said. “I ran into her constantly outside the NPU and she’d be pushing her own empty wheelchair,” in case she got tired and needed to sit in it, Garbett said. “Still at her age, she had this passionate commitment to being out and walking around and seeing what was going on in her city,” he said. “She was tirelessly committed also to APAB, trying to get people to participate in APAB and stressed the importance of APAB,” he said. “She went to all the meetings and always dutifully reported back,” he said. “She was Leo the Lion, but underneath all that she was always concerned about people,” Sister Elaine Osby, a resident leader at Cosby Spear, told APN.